You won’t offend the Memphis Grizzlies by flipping right past them on NBA League Pass. They’ll gleefully admit that 29 other teams are more fun to watch. But as the rest of the league trends toward a fast, beautiful brand of basketball, the Grizzlies play slow and ugly by design. Coming off a 22-win campaign in 2017-18 — a season doomed by a heel injury that sidelined point guard Mike Conley for all but a dozen games — Grit ‘n’ Grind has been revitalized in Memphis. Nobody plays at a slower pace than the Grizzlies — 96.3 possessions per game, according to NBA.com/stats — who firmly believe that going against the grain works to their advantage. So far, the answer often is: not very well. Memphis, a team many observers believed had a decent chance to keep the top-8-protected first-round pick they owe the Boston Celtics in the 2019 draft, is smack dab in the middle of the Western Conference playoff picture as the season nears the quarter pole. The Grizzlies are off to a 12-7 start and only a game and a half out of the top spot in the West standings as they welcome the East-leading Toronto Raptors to FedEx Forum on Tuesday night. 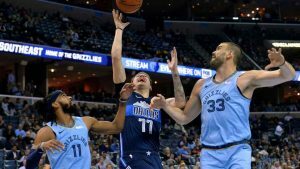 With 33-year-old big man Marc Gasol playing as well as when he was voted Defensive Player of the Year six seasons ago, the Grizzlies allow the fewest points per game (100.9) in the NBA and embrace that their hopes hang on being a dominant defensive team. Only the Celtics and Oklahoma City Thunder are giving up fewer points per 100 possessions than Memphis (103.7).